Activities and lessons in ISTP classrooms are thoughtfully incorporated and diverse, speaking to the different needs of our grades/levels/ages/language immersion programs. Below are samples of student projects that reinforce themes and lessons taught in the classroom. Lauren, 1st grade English teacher, had her class work on phonemic awareness, sound and symbol relationships in words, such as the "at" sound in "hat", "cat", and "mat." They used the book, "There was an Old Lady Who Swallowed a Fly" to help the students practice and learn words ending with the "eye" sound. 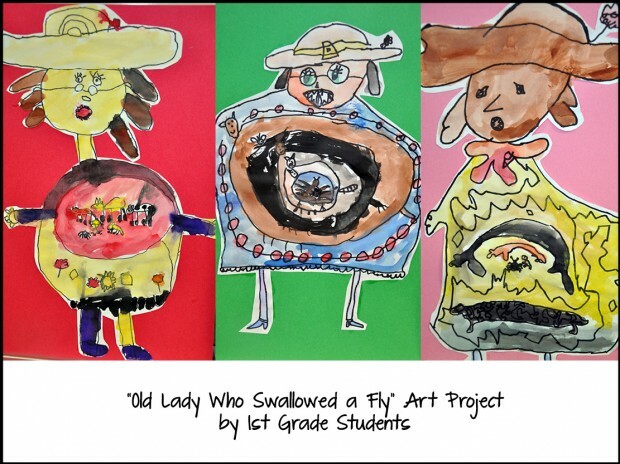 To reinforce the lesson, students worked on their own colorful and creative art projects, featuring the "old lady who swallowed a fly." You'll notice that some students included a concentric view of the stomach contents of the "old lady." 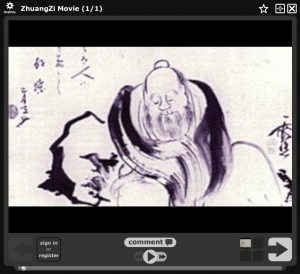 Jin Huo's 8th grade Chinese class has been using VoiceThread, a multimedia cloud service that allows for collaborative conversations with video. 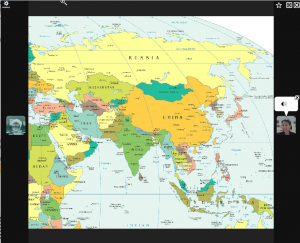 Students can create or collaborate on videos, upload them, and then comment on them using VoiceThread. Jin says that students "enjoy doing it. They're excellent with technology and utilizing their laptops [ISTP's 1:1 laptop program for middle school], it becomes an engaging project. You can see videos of us commenting, using facial expressions and I can also correct their pronunciation... it's a great way for students to bring the thread of learning from school to their home." 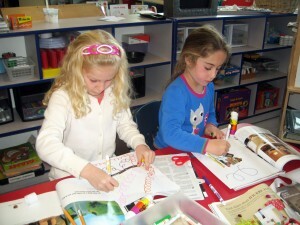 K French teacher, Melanie Laporte, shared these photos of her students doing "graphisme" (pre-writing in preparation for cursive), in which the children cut pictures from magazines and practice loops. French cursive is very unique, and activities range from practicing writing loops and butterflies, which will help them with the specific French cursive style. What's even more unique about this activity is that it was done during "photocopy free week" on our Early Years Program campus. In an effort to reduce waste and re-use existing materials, ISTP initiated various periods during the school year where there's a photocopy freeze. This alone saves so much paper and is so rewarding in multiple ways. Read about a previous photocopy free week here, on our blog.